Gritters will continue to work around the clock as further snow flurries are predicted across the region. Coun Jayne Dunn, Sheffield Council’s cabinet member for environment, recycling and Streetscene, said gritters are working along the primary routes in the city. 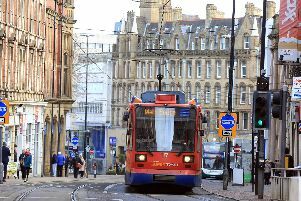 She said: “Since the start of winter, our teams have covered over 37,000 miles of Sheffield’s road network, just over the equivalent of travelling once around the world. “Since 6pm last night and throughout the day today the team have been working around the clock to help keep drivers on the move. Since the snow began to fall some parts of Sheffield have seen 33cm of snow fall. “Gritters are already working along the primary network clearing snow and gritting. Once these are clear they will then move onto the secondary network. We are advising drivers that we will be gritting during the rush hour so please take extra caution when travelling and plan your journeys well in advance. “More snow showers are forecast throughout the night and the teams will be continuing to work hard gritting and ploughing the priority routes, moving to other routes when they can, throughout the night and into the early hours of the morning.